Jordan Seiler, an artist who last year organized other artists to whitewash and create art on more than a hundred illegal billboards (see video here) in New York, brought an example of his “Taking Back Public Space” campaign to L.A. last week by covering an illegal sign on Sunset Blvd. in Silverlake. Seiler calls the placement of a black and white weave on the billboards an ongoing “collaboration” with the sign company, National Promotions & Advertising (NPA). 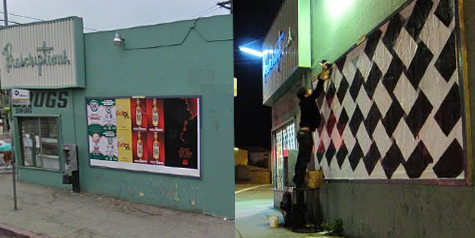 The night-time Silverlake action, as well as similar actions in New York, are documented at Seiler’s website, Public Ad Campaign. NPA is primarily known in L.A. for placing multiples of poster-size advertisements, often for movies and TV shows, on construction fences and other temporary sites. However, the company has also placed many street-level billboards with the posters on the sides of buildings, most often housing small businesses like liquor stores, donut shops, and laundromats. Some of the signs were orginally issued permits for on-site advertising, but virtually all are now in violation of the city’s ban on off-site advertising.